Knives can be very crucial tools when the need arises, sometimes being critical to stay alive. 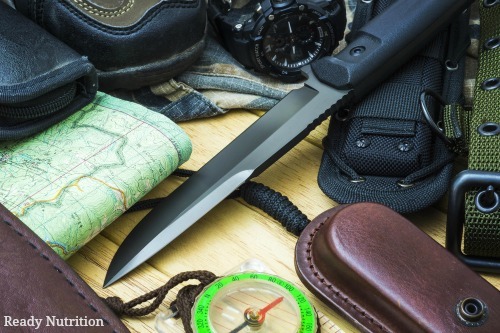 Find out which ones are the preferred models for serious preppers. ReadyNutrition Guys and Gals, we’re going to give some info and recommendations on knives. There are about as many uses for knives as you can imagine: knives for skinning, filleting, fighting, and all-around survival. There are a ton of different companies that manufacture knives, and not as many of them in the United States as there used to be. There is a resurgence in small forges and private knifemakers currently throughout the U.S., and in a future article, I will cover this subject in more detail. For now, we’re going to stick with the well-known firms, of which I have both preference and experience with for different reasons. My “carry” blade for defense is a Spyderco H-1 Jumpmaster model, made in Seki City, Japan. I’ve been “into” Spyderco for a good while; when I was in the service I carried a Spyderco Police model stainless steel folder. This Jumpmaster model is actually designed by jumpmasters of the U.S. Army. The blade is sharp – beyond belief and can be sharpened on a Tri-Angle Sharpmaker, also made by Spyderco. The jumpmaster’s blade is straight, serrated, non-rust steel with a single piece running continuously from blade to handle, a fixed blade with a plastic handle. The blade measures approximately 4-1/4 inches of special steel that does not corrode. I mention again, it is for defensive purposes and I know how to use it, although ideally, a fighting knife should have a blade of approximately 8 inches or greater to be most effective. I also carry a Buck 181 folder for all-purpose and utility that is about 3 inches long. This model has an oval-shaped “pinch” ring within the blade, and a clip that enables you to pinch the ring, draw out the blade, and flick it open in the locked position. The Spyderco Police model I mentioned earlier is the same configuration as this Buck folder. It can be used for cutting, slicing, and (if necessary) small skinning jobs if the need arose. As far as a good general purpose survival knife is concerned, I really love what Gerber puts out (or rather, the older models), with the Gerber BMF series being really great. As far as newer models run, I have a Gerber Mark 11, a two-edged blade similar to the Fairbairn-Sykes Commando model used by the OSS in World War II. The knife was made in the U.S., and the sheath was made in China. Guess we can’t win ‘em all. The blade is approximately 7 inches in length with 2 inches of the blade on both sides being serrated before the final 1 inch connects with the handle/hilt. Hibben (in my assessment) makes the best throwing knives. When you pick up throwing knives, you should pick up 2 sets of the same model: one to practice with, and the other for use when needed. In this manner, you’ll be able to sink that knife into a target from 15-20 feet away with no problem, and the quality/sharpness will not be a factor when you face a real-world situation. If you wish to watch an excellent movie that will give you pointers as an introduction to combat with knives, pick up “Hunted,” starring Benicio Del Toro and Tommy Lee Jones. They go “deep,” but the depiction of the U.S. military’s courses on knives, knifemaking, and actual combat techniques is very accurate. Your folder you want for a good all-around utility knife. For small cutting, just invest in a little folding pocketknife so as not to dull your blades continuously. Although 8” is the preferred minimum length for combat, do not underestimate what you can do with a smaller blade when the need arises. You want your knives to be maintained and as sharp as possible at all times. I don’t really wish to cover skinning and filleting knives, simply because there are so many on the market that you can use. I covered these because when push comes to shove, your combat blade can be used to skin game if need be. Just as all cooks in the Army can become infantry when needed. My preference is for the blade to be either black (subdued), or non-reflective/non-high sheen. My personal preference (although for some specialty blades such as my jumpmaster model you need a specialty sharpener) is the old-fashioned stone and oil method. It takes time, but it’s worth it. Other methods (non-specialty) put a “quick” edge on it that doesn’t last too long, but the honing stones take a longer amount of time and deliver in the end. Yeah, it’s a long statement, but it’s the truth. Knives can be very crucial tools when the need arises, sometimes being critical to stay alive. Look up those models that I recommend, and you’ll find without exception that they’re expensive. The thing is, they work, and when the chips are down, I can depend on them far better than some cheap piece of junk from China or Pakistan made of pot-metal and Elmer’s glue. Take your time to find which model works the best for your needs, but never sacrifice quality for price. Keep your powder dry and your knife oiled and sharp! JJ out! There are some excellent, high quality knives out there! More than enough to fill every need. Yet, some the longest serving, toughest and most useful knives I’ve ever come across, were neither expensive nor aesthetically pleasing. I’ve used knives like the one my Dad had, and his dad before him; knives made out of flat files, even the leaf spring from an old truck….and they served very well, for more uses than many think a knife should or even could! That being said, it’s hard to resist the temptation to trade up when masterpieces like the ones shown in the article above come calling your name. I had the Gerber pictured, good strong knife, a bit heavy, awkward and slippery for me, I gave it to a friend. My Buck Ranger is well made folding knife, but it takes a little to long to get it out to use.. My Swiss Army is fantastic, but more as an emergency kit tool. The mighty Leatherman Wave, maybe not a knife per se, but an excellent tool with knife capability in the form of blade and bone cutter, nice, but once again awkward if using it as just a knife because of the imbalance, it comes with a lanyard for good reason. There have been others, there are always others, but my absolute first and foremost favorite is actually two knives. Keep in mind I do lot of estuary fishing for Mulloway, Squid, Flathead, Kingfish and Shark and need the best. One is a Humvee flick knife with five inch blade. I can whip that baby out, precisely cut, fold and return so fast I consider one of the most effective emergency tools ever. With fishing lines its great because of its pointy tip it can really get in there. The thin blade is perfect for filleting smaller fish and its razor sharp, down side, its a bit weak, I wouldnt even stab it into a cutting board, but used delicately, irreplaceable. And then there was one, Like Mogwai from Jungle Book, I call it my tooth. Its a cheap Chinese fixed blade fishing knife with serrated back edge, fourteen bucks. Probably pounded out of an old truck bumper it is incredibly strong, sharp, and reliable. It is the only knife I have ever had that can rip right through shark skin and bone. It hammers and chisels, its fantastic. And I dont mind losing it because I like it so much I bought two. It even stabbed through a car door once. Look at the time, gotta go fishing.